CSR Classics is a follow up title to CSR Racing. This iOS version was released in October 2013. It is developed by Boss Alien Ltd and Mad Atom Games and published by NaturalMotion Games. The gamer takes the role of a new racer arriving in the city. This version is different from others thanks to its graphics and gameplay. Graphics: CSR Classics is powered by a brand new graphics engine. It features cutting-edge particle effects as well as a real-time reflection. Apart from that, CSR Classics gamers can also profit from a volumetric lighting to improve its quality. 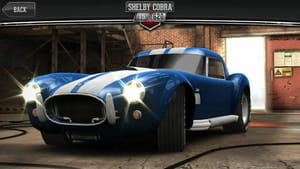 Gameplay: compared to the former version, CSR Classics requires more concentration if the player wants to win against the best racers proposed to him. Timing has been improved to make racing even more exciting. Licensed car: CSR Classics gamers are given the ability to upgrade cars. Apart from that, they are also free to choose among the greatest cars ever made in the game's collection. Among others, let's cite here classic models from Audi, Ford, Mercedes, Plymouth and others. Challenge: gamers are engaged into a breathtaking race where several cars have to compete with each other. Some cars are going head-to-head for a first mobile racing game, such as Cobra vs. Mercedes 300SL or Ford Mustang vs. Skyline. Rides can be upgraded in order to win intense drag races. CSR Classics can work with iPhone, iPad and iPod touch and is optimized for iPhone5. This game is quite heavy. Latest update on November 20, 2016 at 05:36 PM.